I'm still fighting with the Lambert projection..., we'll get there. The soft is almost good to be released, as - let's say - developer preview. Print capabilities have been added too. 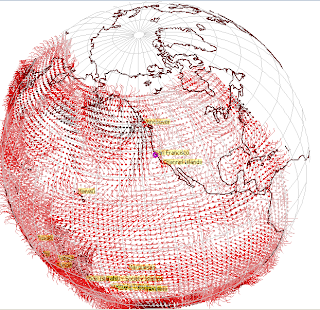 The superimposition of the faxes works well for the Mercator projection, and this is the most important for now. Surface analysis below a 500mb chart are really kicking asses. Quite a neat tool. Superbe ta représentation 3D du globe et des courants atmosphériques.